T3’s favourite console launch games - ever! Are the days of the traditional launch game over? Launch games can be hit or miss; both the PS4 and Xbox One certainly fired a few blanks when they came out the gates. But with the news this generation could live on, with iterations of the current consoles in the PS4 Neo and Xbox Scorpio, it raises the question of if we'll ever get a traditional launch game again. Here at T3 we've decided to get nostalgic and look back at some of our favourite console launch games. The Tekken series has a great legacy. The launch game for the PlayStation 2 didn't disappoint by providing you with the largest roster of characters the series had ever seen. The game wasn't part of the main series, meaning it didn't have a storyline and focused on the addictive gameplay that's always given the series its legs. The wide variety of game modes and couch competitive play is enough for you to lose tens of hours of your life. Time well spent though! The now defunct Evolution Studios gave PlayStation 3 gamers an awesome racer that differentiated itself from others on the circuit with fast and frantic gameplay with a heavy emphasis on car destruction. The courses were diverse (although the colour palette improved in the sequel) and the graphics at the time were some of the best on the console. This is another game meant for competitive play with a friend on the sofa; smashing each other's cars in a heated battle for first place sums up MotorStorm perfectly. A lot of people argue that Gears of War and Oblivion were the games that really kicked the Xbox 360 into gear. But Condemned was the launch game that gave players something they'd never experienced before. The game has a big focus on melee weapons when fighting enemies, meaning if you happen to find a gun, there won't be more than a handful of bullets for you to use. The game always stays in first person, even when performing the unique executions on enemies. When it was released it was also one of the scariest games ever made, but even now it's still advisable to take a spare pair of underwear if you decide to give this incredible game a try. When the PlayStation Vita launched it promised gamers console quality gaming on the go. Sony Bend managed to deliver on that promise by taking the Uncharted name and giving Nathan Drake a better adventure than the first one on PlayStation 3. The game looks stunning on the Vita display and plays exactly how an Uncharted game should. There were no corners cut with all the usual characters reprising their roles. Some of the features of the Vita were put into this adventure, but it's nothing that hinders the overall experience, just a few touch mechanics here and there. Golden Abyss manages to hold its own against the other entries in the series, and it does it while being completely mobile. Wii Sports is the only game that's ever been able to draw an entire family in and have them gathered round a console at once. The wide variety of games available means there's room for your brothers and sisters who want an intense game of tennis as well as your nan who only wants to play a couple rounds of bowling. The game utilises the motion sensors of the Wii and provides the player with well honed mechanics that gives that 'one more game' feeling. Halo is probably one of the few games that's managed to establish itself as a household name. Combat Evolved is not only the best launch title for the Xbox, but one of the best games on the system altogether. The game managed to weave together awesome visuals, an incredible story and perfect gameplay — not bad for the first in the series eh? The refined nuances of the game are what make it special; the music is a masterclass and always seems to kick in at the right moment. The multiplayer was the final touch that put this game in students' hands and got them playing nonstop. The 360 carried on Microsoft's legacy of delivering an almost perfect shooter on day one with Call of Duty 2. The game built on what the first did right by improving the visuals and delivering an even better campaign. When you think of World War Two you generally think of the fields of France, well Infinity Ward certainly don't. The game takes you from the beaches of Normandy to the cabin of a tank in Africa. The game also featured a first glimpse of the incredibly addictive multiplayer that was to follow in subsequent games. Super Mario 64 put the plumber in three dimensions and created a new genre of games in doing so. The game transported users to a new and brightly coloured world that lets you explore it at your own pace. The story is the same as it's always been; yet again Princess Peach has been kidnapped by Bowser and it's your job to jump into various paintings in the castle to complete levels and eventually confront Mario's rival. The levels range from romantic environments to creepy castles and always keep the player wanting more. By the launch of the PS3 Insomniac were known as the Ratchet and Clank guys. 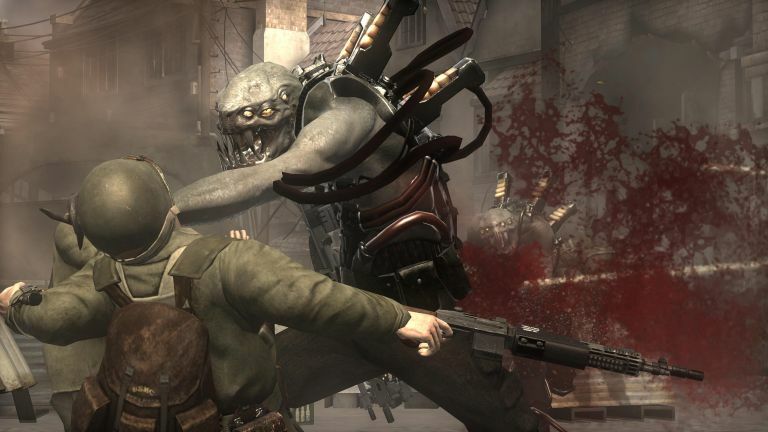 But they proved they could put all their crazy weapon ideas in a much more serious first person shooter in Resistance: Fall of Man. In the game you take Nathan Hale through an alien invasion in a compelling tale of survival. The game takes place in an alternate reality where World War Two never happened and instead the world was taken over by the Chimera. The game features weapons that give some of the most fun in any shooter and you'll be putting them to good use against AI that was some of the most competent back at the console's launch. Super Mario Bros is the game that brought about everything we have today. The game managed to revive a very much slumping video game market in the states and created an entirely new generation of gamers. Gameplay is king in any game, and Super Mario Bros has it nailed down perfectly. Everything from the beautiful visuals to the hidden secrets in every level make this game worth visiting even if you weren't around for the game's launch. This game isn't only the best launch game of all time, it has cemented itself as one of the best games of all time. Did we miss any bona fide launch classics? If so, let us know in the comments below.